Our autism EHR software is specifically tailored to support organizations that provide services for individuals with autism and enable them to live a life full of opportunities. Our autism services software simplifies scheduling, documentation and reporting, freeing up your agency resources to focus on helping individuals connect with their loved ones and communities. The behavioral tracking app supports data collection wherever you provide care. Our autism EHR software enables interoperability, mobility and reporting procedures, as well as integrated billing features. Our assistive technology software for autism supports the complex billing requirements of Medicare and state Medicaid. We can help you navigate applied behavior analysis (ABA) billing for specific therapy applications, including assessment, reassessment, direct services, supervision and parent training. We help simplify case management, coordination of services and documentation so you can focus on providing services for individuals on the autism spectrum and their families. Providing support and services for individuals diagnosed with an autism spectrum disorder typically requires unique workflows and other considerations. 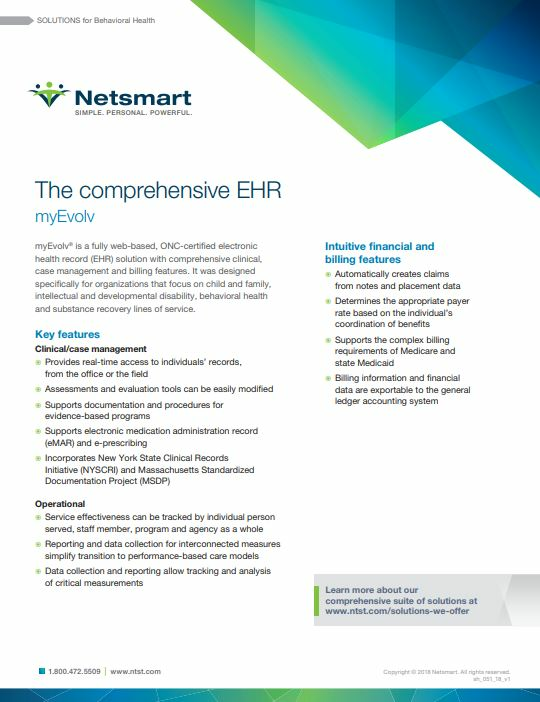 "We chose Netsmart after a rigorous selection process because of our shared vision to have our client’s complete physical and behavioral health record available for our organization and our health provider partners to provide a high quality, consistent continuum of care."